Inspiring, innovative, empowering and business-savvy are just a few of the words often used to describe Florine Mark, President and CEO of The WW Group, Inc., based in Farmington Hills, Michigan. Florine, has used her knowledge, influence, energy and resources to help people help themselves. Florine hosts a radio show called ReMARKable Woman; about inspiring women with the vision, the talent, the creativity, and the knowledge to succeed. These women impact their own lives and the surrounding communities. Maggie Varney our Founder & CEO is honored to be a special guest on her radio show today which will be aired at a later date. Hair Donation Event Live on the MZone! Flagstar Crafts Community Competition Now Open! Jimmy Johns Baseball Tickets Now Available! Help Build Our Forever Home! Help Us Win $5,000 from Flagstar Bank! We’re Hiring...come grow with us! Lake Shore High School Cut-a-thon Photos! Thank You, Clinton Township Kiwanis! WMU Broncords are Hosting Chords 4 Kids! Volunteer Expo with Blue Care Network! Gifts from friends in Avenal, CA! Sign Up for our Field Trip to the Detroit Institute of Arts! We're looking for an Art Teacher! Introducing our Give Back Board! We need LARGE raffle baskets - please donate! 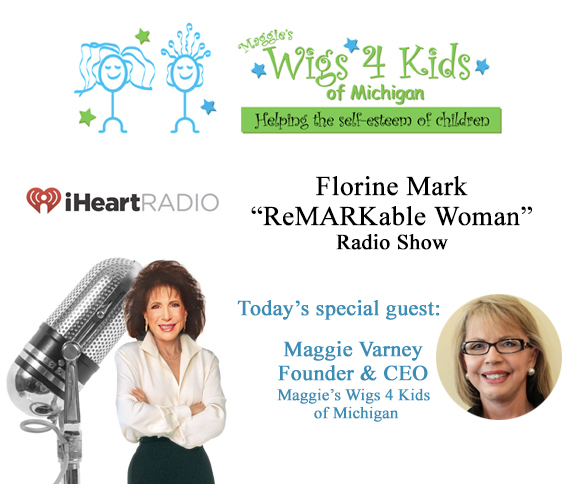 Join Maggie's Wigs 4 Kids of Michigan and Michigan legislators pass bills encouraging insurance to recognize the need for a child to have a wig like any other prosthetic.